Christmas is all around us and this week we dive into it head first. We interview Craig Mitchell, an Adelaide Hills man whose family ditched Santa from their December festivities because they thought he gave the festival the wrong slant. How did they do it? Why did they do it? Listen in to find out. We also chat with Jim Manning aka Santa. Jim is an Adelaide man who has ‘played’ Santa for more than a decade. He has had the privilege of listening to little children whisper their secrets and desires into his ear. He tells us about the ‘magic’ of Santa and his belief that parents should not force children to believe or disbelieve in the mystical elf! We also hear about one of South Australia’s food and gourmet legends, Jakob Wintulich. He is the man who started the Wintulichs tradition of smallgoods. And as we’ll hear, it all could have come to nought, given the treacherous journey he took 100 years ago to arrive safely in Adelaide and then the Barossa Valley. Brooke from Rainbow Fresh pops in to urge us all to try Baby Chard as a Xmas salad – it is green and red after all – and reveals its secret powers to lure children to eating their greens! Oh, and the photo? 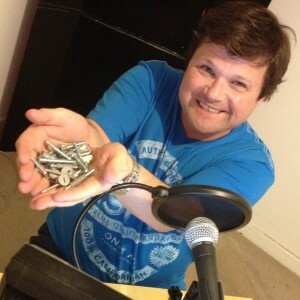 That is Colin with the left over screws and bolts from the new, podcast studio tables that Steve’s dad put together. Hold on tight! Intro: Our original theme song is here, Adelaidee Hoo. Note, throughout the podcast we also use free sfx from freesfx.co.uk for the harp and the visa stamp. Shout outs: Steve sent a cheerio to his dad for helping build the new podcast studio and Tim Ashdown for lending us a radio play to build up courage to record. Colin sent a cheerio to Brett, who was away on Plan B practice. South Australian Drink Of The Week: Nigel raided his cellar and brought along a Penfolds 2009 Bin 138 GSM. It was a fine drop for toasting our late patron, Queen Adelaide. Tasting notes. Stories without notice: Colin goes to hear Sharky and the Caddman. Steve discovers the Golden North Barista Bar thanks to Peter and Trevor from the iconic icecreamery. Nigel reveals details about his genius and imaginative son – just think morse code and robotic vacuum cleaners! Interviews: Adelaide Hills man, Craig Mitchell, on the rejection of Santa from his family’s Christmas tradition. Jim Manning on playing Santa in Adelaide for more than a decade. We also refer to this Advertiser article on Ten Things Not To Buy Before Christmas. Stories From The Street: Brooke from Rainbow Fresh tells us about Baby Chard, the Xmas-coloured salad leaf that is also a hit with fussy kids. She shares a simple recipe. Adelaide’s Yesterdays with Colin: Steve Davis talks with Chris Hummell, Managing Director of Wintulichs about Jakob Wintulich, his escape from a vicious sea captain and birth of South Australia’s smallgoods industry. Along with a tip about how to prepare metwurst like you’ve never tried it before! Brett’s Musical Pilgrimage: Gregarious performs South Australiana – a parody of Australiana done for Adelaide radio, many years ago. Does your suburb get mentioned? Many special thanks to Greg Meyer for letting us play this slice of Adelaide radio history.